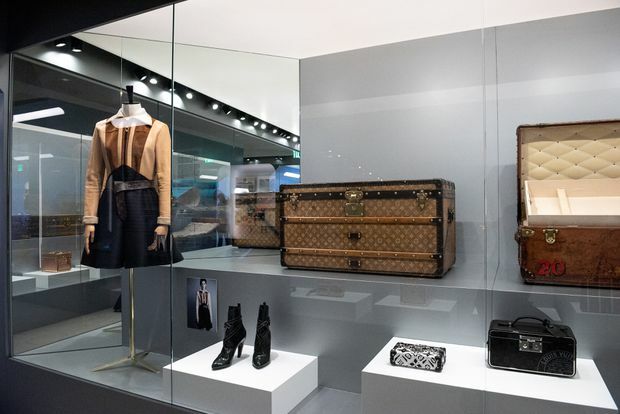 An exhibition called Time Capsule at Toronto's Union Station will examine how Louis Vuitton has catered to the changing desires of first-class travellers. French fashion house Louis Vuitton is bringing some of its storied history to Canada. From Sept. 7 to 30, an exhibition called Time Capsule will be on display at Toronto’s newly renovated Union Station. It’s a fitting venue for a company that got its start making accessories for an emerging class of globetrotters. The art of travel has changed drastically since 1854, when its namesake founder began making trunks for carriage, boat and train, and Time Capsule examines the way that Louis Vuitton caters to the ever evolving wants and needs of first class wanderlust. The exhibition is housed in a temporary structure made of brushed aluminum located next to Front Street on the north side of the station in the Sir John A. MacDonald Plaza. It uses archival pieces to highlight six key aspects of the brand’s history, including the distinct features of its first trunks, more contemporary collaborations with artists such as Stephen Sprouse and Richard Prince, and innovations in travel accessories, such as an early zinc case that opens into a fold-out bed. There’s also the Artisans Room, where Louis Vuitton craftsmen will host live demonstrations of the handiwork that goes into their pieces. With previous appearances in cities such as Hong Kong, Berlin, Los Angeles and Dubai, the exhibition’s arrival in Toronto is its first stop in Canada and marks the brand’s 35th retail anniversary in the city. It’s accompanied by a pop-up bookstore in Union Station’s Front Street Promenade where small accessories like stationery, fragrance and notebooks will be available. Yves Saint Laurent Beauté is bringing a swish boutique hotel experience to Toronto. For two days only on Sept. 12 and 13, YSL Beauty Hotel will be opening its door at 195 Spadina Ave. The ephemeral inn has already made appearances in Paris, Tokyo and New York, and brings rooms full of beauty to life. The latest launches will be in the lobby, while the second floor is home to a digital pop-up shop of more than 300 products. As with any hotel, reservations are required. To make yours, visit yslbeauty.ca/en/yslbeautyhotel. M. P., the in-house label of men’s online shopping destination Mr Porter, is expanding into footwear. This new line aims to provide the essentials every man needs including both casual and more formal styles. The initial eight staple pairs include loafers, Derby shoes and leather sneakers, and will be accompanied by seven seasonal styles launching for the winter season – think boots of all kinds, including lace-up, desert and shearling-lined. Launched in November, 2017, Mr P. was created to offer a stable of classics as well as offer limited-edition trend-focused pieces. Beloved by royals and regulars alike, Smythe is taking its signature blazers on a cross-Canada tour. The brand will be making stops at six Holt Renfrew and Ogilvy locations where it will be offering a customization program for the Patch Pocket Duchess Blazer (yes, the style regularly spotted on the Duchess of Cambridge). Select from a variety of fabric, buttons and patches to customize your own blazer and it will be delivered to you at the end of November. On Sept. 12 in Calgary, co-designers Andrea Lenczner and Christie Smythe will be making a personal appearance. With all the global cinephiles in town for the Toronto International Film Festival, several Canadian brands are launching pop-ups to showcase their local goods. Bonjour Toronto is made up of three Montreal-based brands: June Swimwear; Maguire, which makes footwear and handbags; and The Natural Curator, an online retail platform for beauty products. They’ll be setting up shop at 505 Queen St. W. from Sept. 6 to 16. As the official footwear for TIFF, Sorel is bringing its fall collection to its first Toronto pop-up shop. At 356 King St. W., find the London, Ont.-based brand’s latest fall collection all in one spot.